Blogging slowed down a bit recently due to (variously or simultaniously) bad weather, work, bugs or unavailability of dive buddies. I entered one of the better photos I made this year (from this post) in the BBC Wildlife Magazine competition for fun and managed to get it published in the May issue, which was nice. I think I only went out once, which was a pontoon excursion in Mylor marina, the first time with the Canon G16. I tried some shots from above lying on the pontoon; I need to actually get in the water to get a better view of all the sponges, tunicates, peacock worms, mussels, oysters, anemones and seaweeds encrusting it. This shot of the Light bulb sea squirt Clavelina lepadiformis turned out best, but I believe there is a lot of room for improvement. I have bought a light which I will bring next time. I also ordered a strobe, so hopefully some proper dive photos very soon! 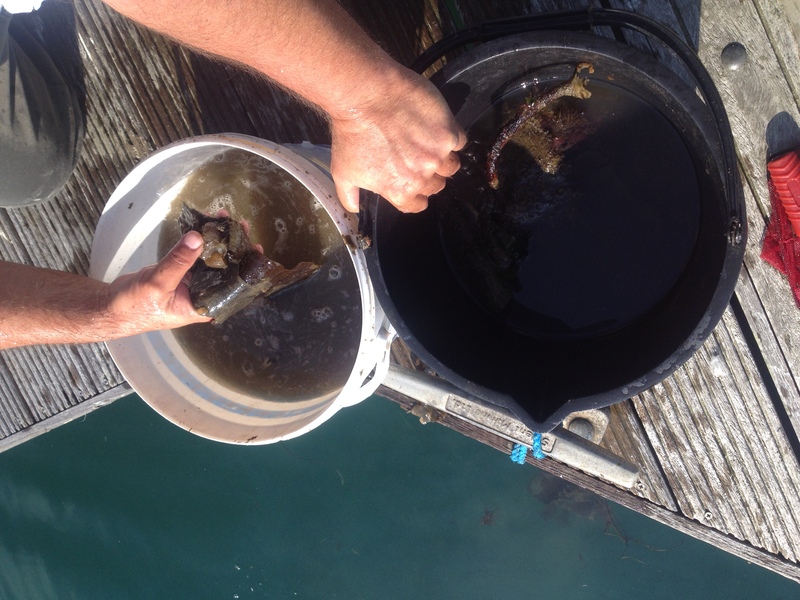 This Saturday I was at the marina in Newlyn, where local natural history expert David Fenwick was kindly showing me how he obtains the samples he finds so many creatures in (worms, copepods, tunicates, forams and many other things). 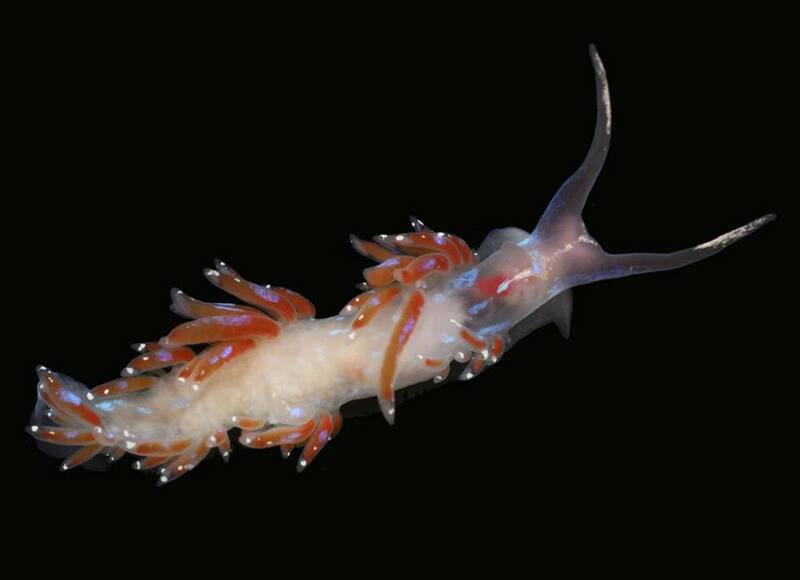 Todays focus was on nudibranchs, arguably the most beautiful group of little critters. 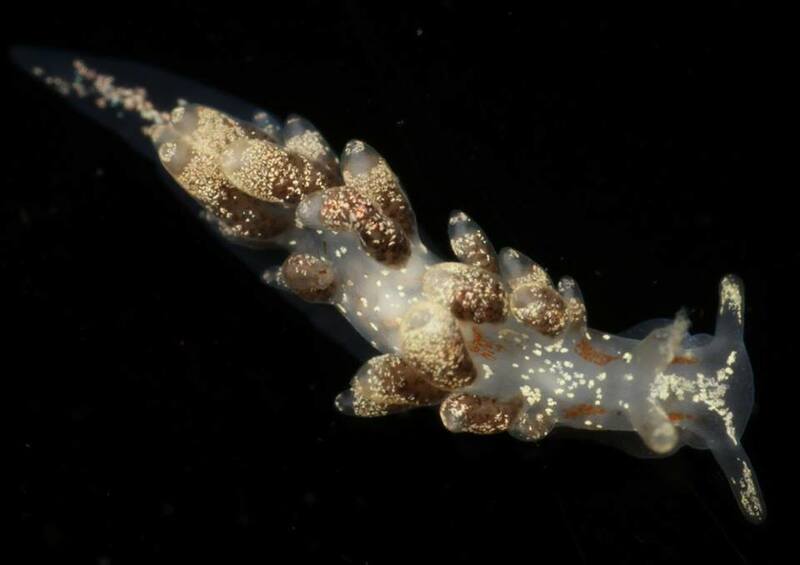 David has recorded an amazing 46 nudibranch species from these pontoons alone! As this is the most Southwesterly pontoon in the country, it is a bit of a ‘sentinel site’ for southern species with northward-shifting ranges. 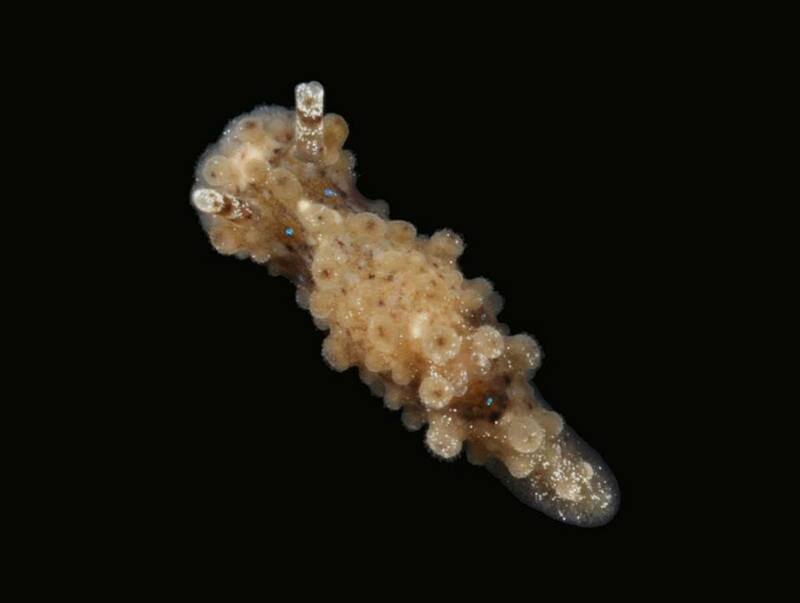 Indeed David has found a species new to the UK that has also been discovered in the south of Spain and possibly off the coast of Morocco. He often sends samples away to (inter)national labs for sequencing and further investigation and frequently shares his finds on facebook (see the links page for relevant facebook groups). For all things marine in Cornwall see his website: Aphotomarine, an edicational resource dedicated mainly to the photography and diversity of marine life that is found in the coastal waters and rockpools of south-west England. 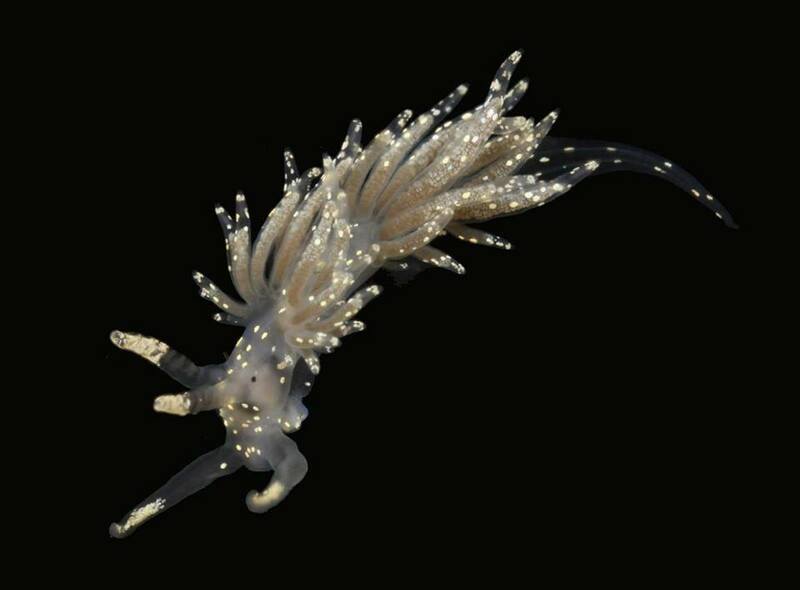 Also check out his Aphotofungi, Aphotoflora, Aphotofauna and Stauromedusae.uk. Luckily for me, I can show off some of David’s images in this post too. 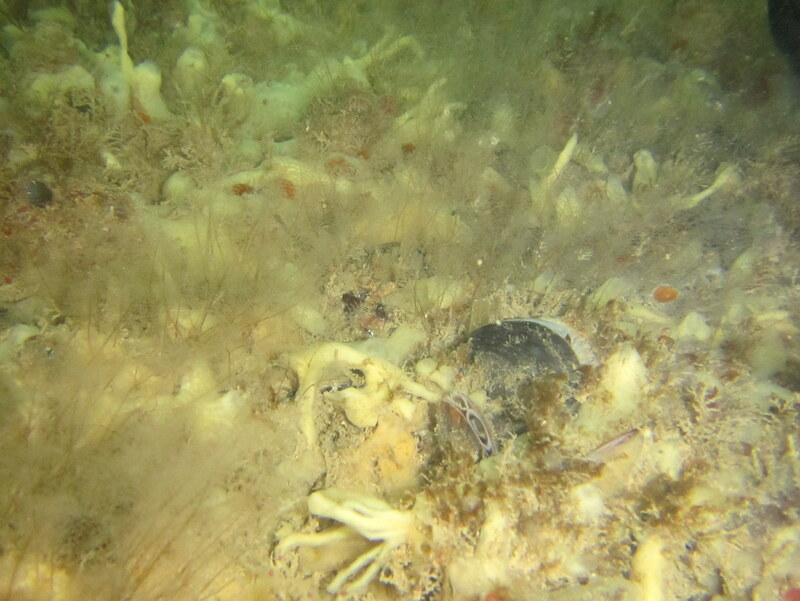 The drill: scrape off seaweeds (mainly kelps) covered in tunicates, hydroids, other seaweeds and silt (very mucky business, especially when collected lying on a pontoon covered in seagull-excrement). Next, vigorously wash the seaweeds in a bucket. 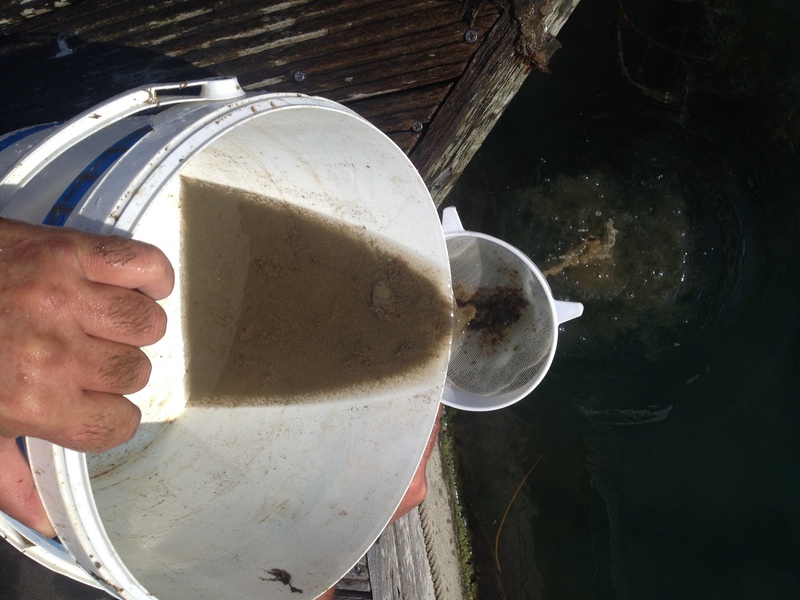 Sieve the resulting silty water, pick out larger objects (sea squirts etc) from the sieve and gently wash the silt away in a fresh bucket. Then transfer the material to a white tray for preliminary inspection. 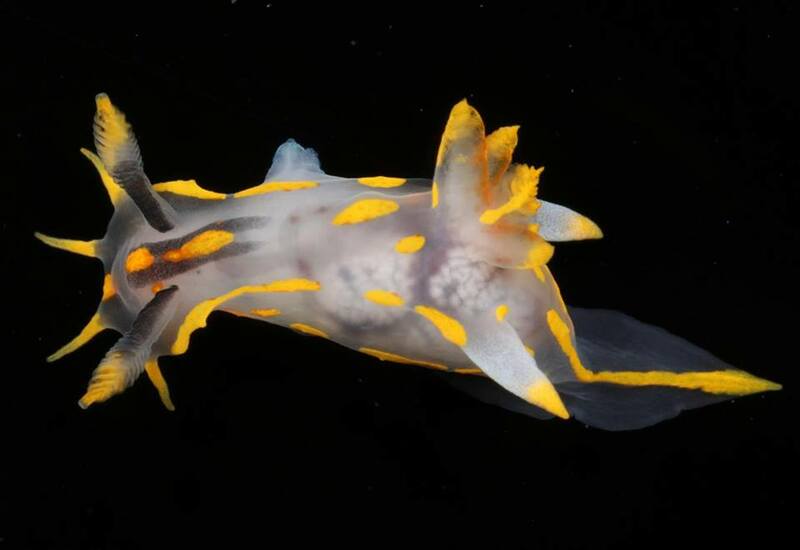 Some nudibranchs can be observed this way, but the bulk of the animals only show themselves after the sample has been brough home. In warm weather, samples can get deoxygenated, so a battery-powered airpump is a good thing to have. 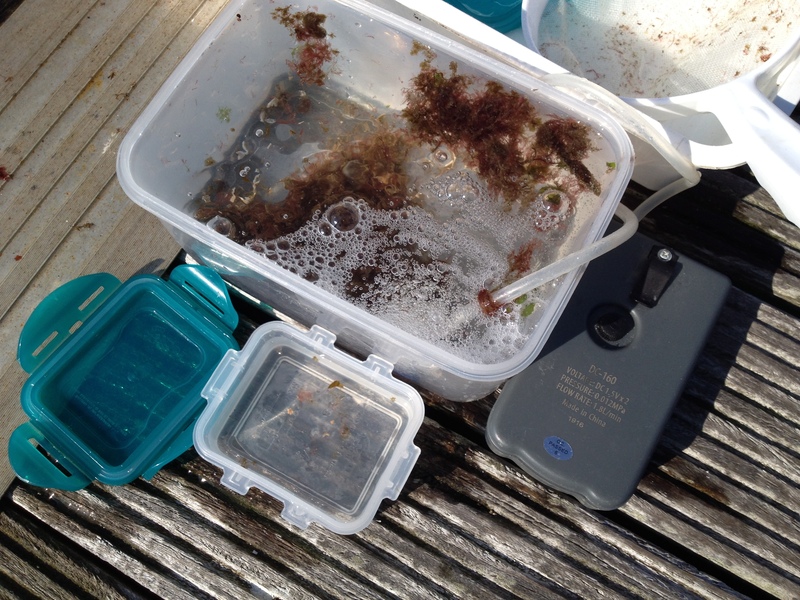 To avoid sloshing, plastic vessels are filled to the brim by opening the lid slightly when held underwater. Back home, samples are placed in the fridge and subsamples are periodically checked under the stereomicroscope. Most animals are a bit more active in the cooled water but some are not. Some come out in the dark, others in the light, so changing the conditions is necessary to see everything that is hidden in the debris. David processed the samples that same afternoon and indeed a lot more came crawling out! From top to bottom: Cuthona amoena, C. foliata, Doto sp., Eubranchus farrani, Facelina annulicornis, F. auriculata, Polycera faeroensis, Elysia viridis (juvenile), Palio nothus, Aegirus punctilucens (juvenile) and Polycera quadrilineata (same species at the top of the post). 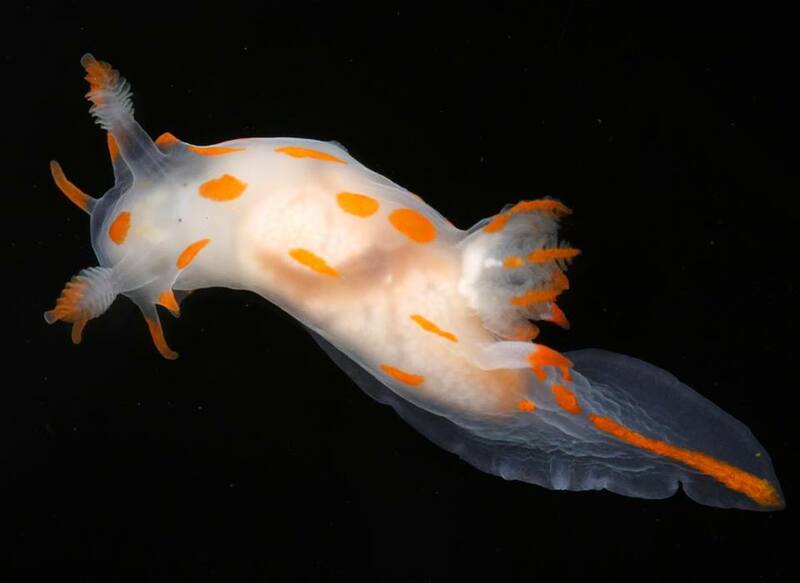 For more beautiful nudibranch photos see the relevant Aphotomarine section. A very cool activity indeed, although at this point in my life I have not enough time at my disposal to do it justice…However, there definitely will be some smaller olloclip-iPhone sessions at Mylor marina soon! In the series ‘pontooning‘, I returned to Mylor a week ago Friday to have a quick look around in the marina. The water was choppy, but visibility on the sheltered side of the pontoons was OK. I noticed a brown slug-like thing flapping about next to a boat. 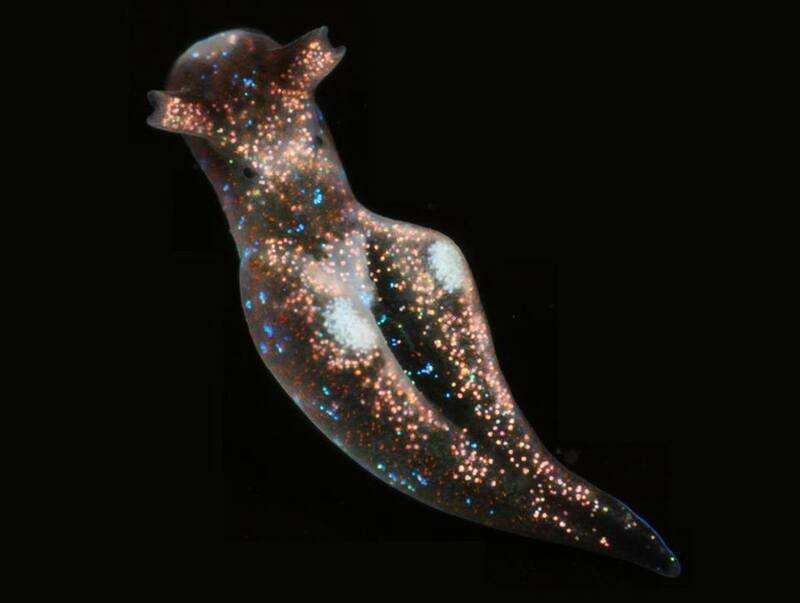 My first thought was a sea hare (I have seen plenty but have not yet seen them swimming). 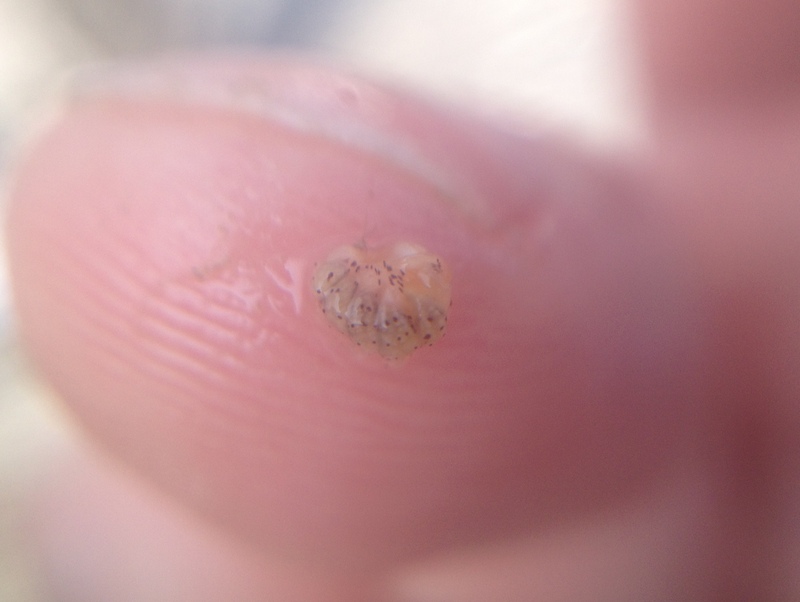 Upon closer inspection, I saw that it was something else, it had a shell like Haminoea or Akera, species I had never seen, especially not swimming. 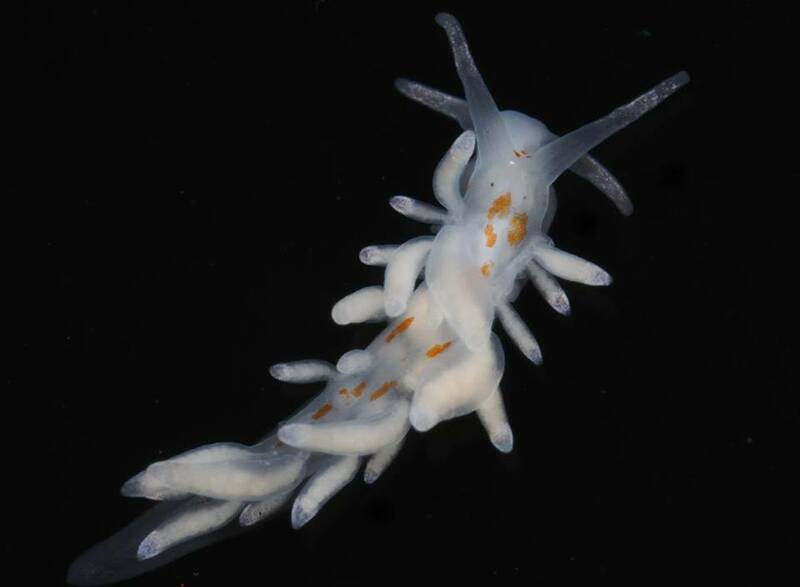 It turns out that it was Akera bullata, an Ophistobranch mollusc that is rarely seen in Cornwall and generally is observed crawling on the mud, not swimming. Why they swim is not well understood, but they usually swarm in numbers and so there must be some general response to the environment or mating behaviour going on. I saw four other individuals nearby so that fits. I made a couple of movies but as I could not look through the viewfinder the footage is not great (I went back Saturday and Sunday to try and find them back but was not able to). 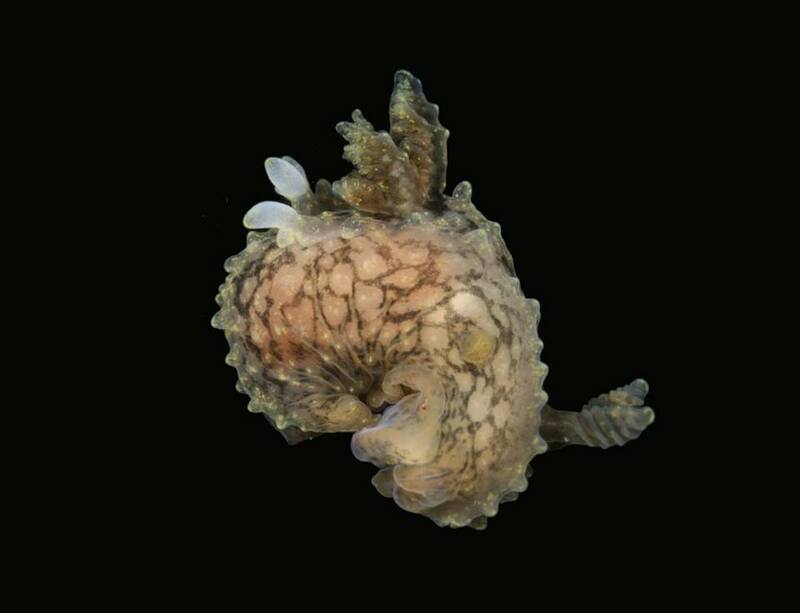 The shell can be clearly seen hanging down (Akera is related to the Sea hare but has retained its external shell). When lifted out of the water, the animal folds its mantle around its shell. There were some other interesting things to see. 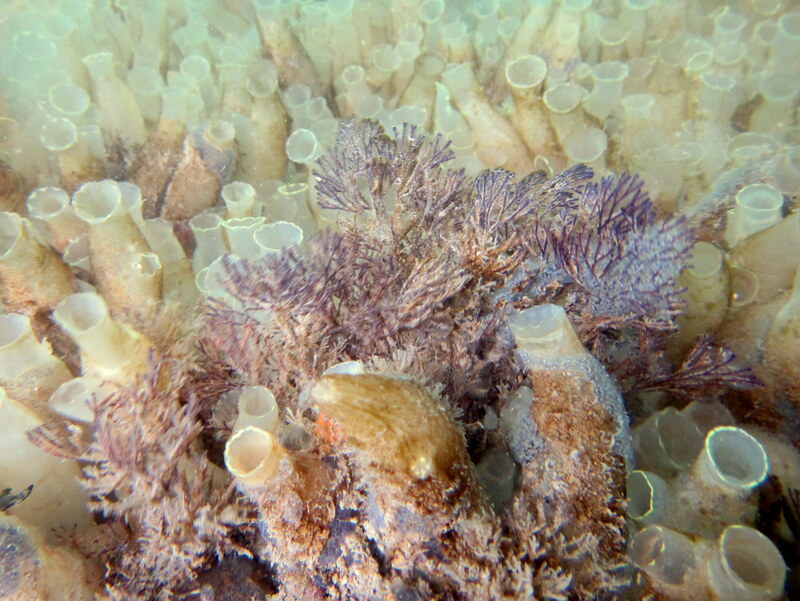 The dominant organism on the pontoons is the tunicate Cione intestinalis (I see there are some other tunicate species hiding in these pictures; I will have to take a closer look next time). Amongst it grows the purple invasive Bryozoan Bugula neritina. 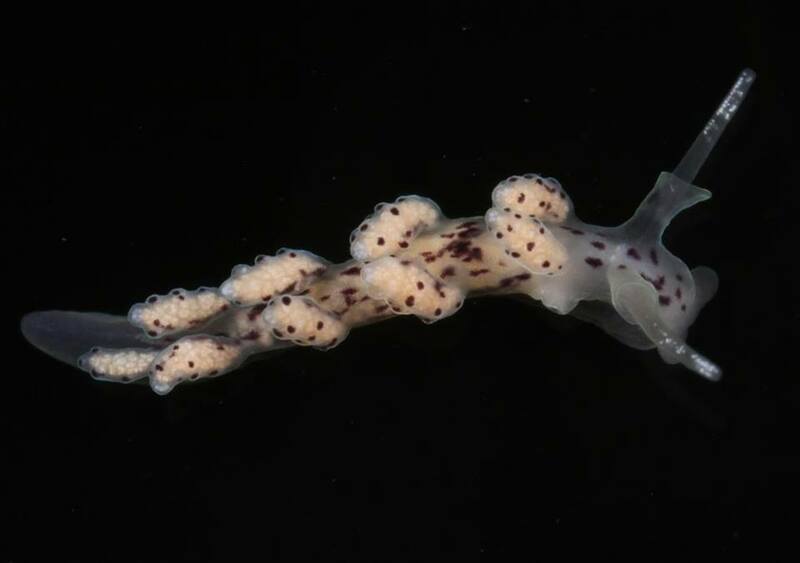 Next, a colonial tunicate thta could be Botrylloides violaceus, Trididemnum cereum or Didemnun maculosum (or something else again). 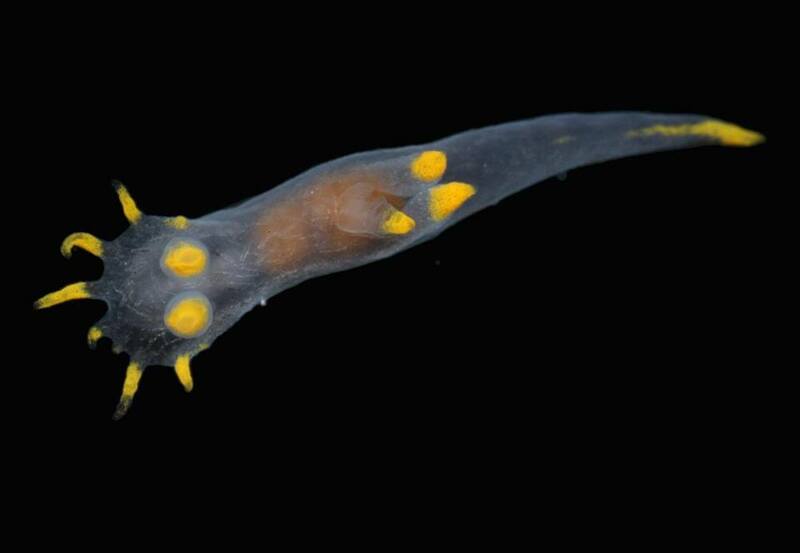 After that, the beautiful Lightbulb sea squirt Clavelina lepadiformis. Plumose anemones Metridium senile are always common here. I for the first time noticed another species Diadumene cincta, very pretty! Another small post. 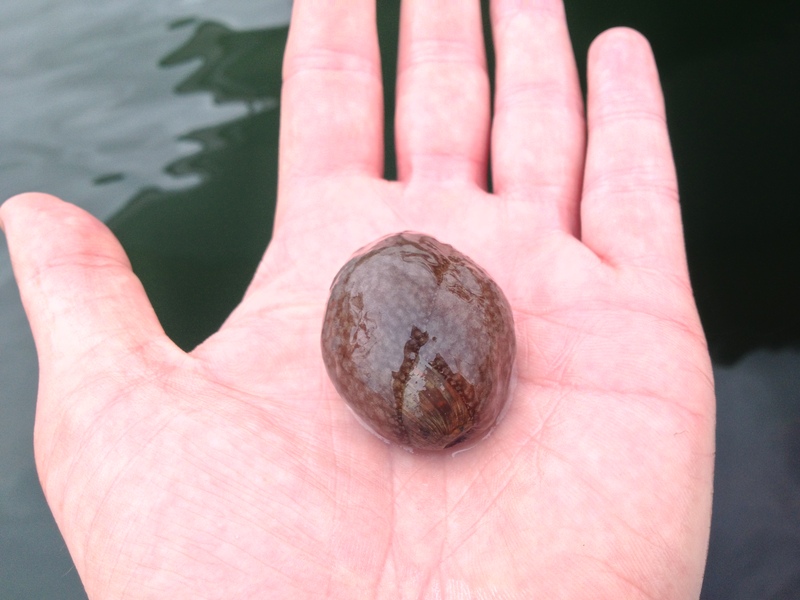 I went out to the marina in Mylor Harbour to check what the pontoons looked like. It turned out OK-ish but no Peacock worms and only a few little Plumose anemones. 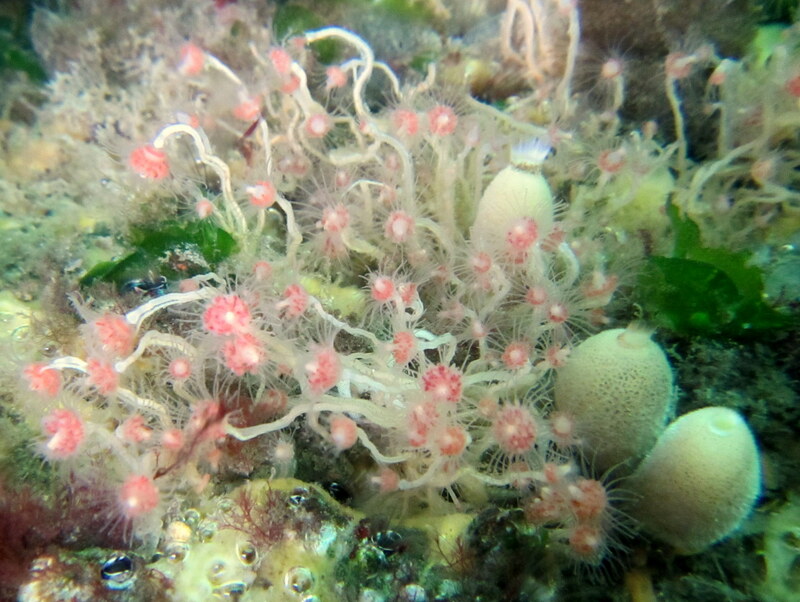 However, the trip was worth it solely by the find of a hydroid colony, which my Seasearch guide told me was the Oaten pipes hydroid Tubularia indivisa. Very pretty! By taking 30 photos with my Canon Powershot, I ensured I had a couple in focus. Also in the frame some little Sycon ciliatum sponges (these are a lot more rounded than some of the others I have seen, see here). (Annoying that wordpress makes the 2nd clip smaller!) 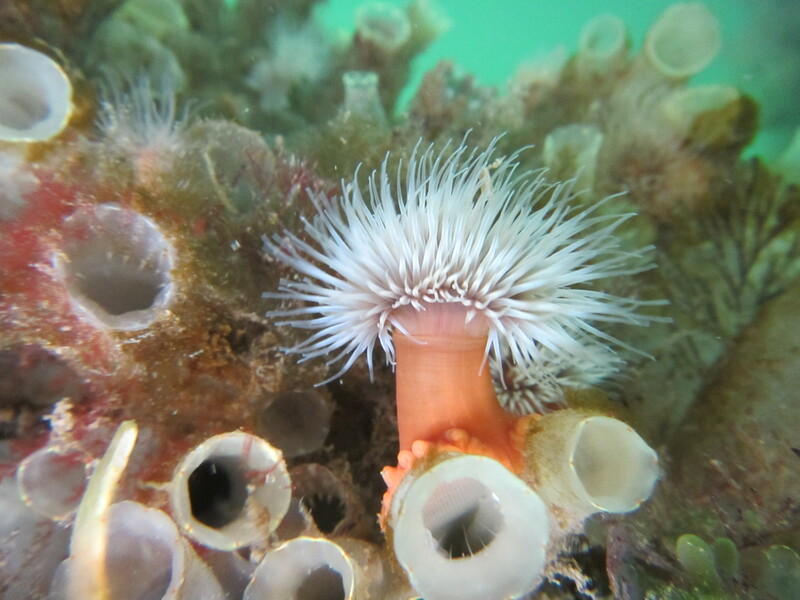 I managed to find back the single 1 cm Elegant anemone Sagartia elegans mentioned in the last post but again was unable to remove it; seems like this species knowns how to attach itself a bit better than do Plumose anemones. 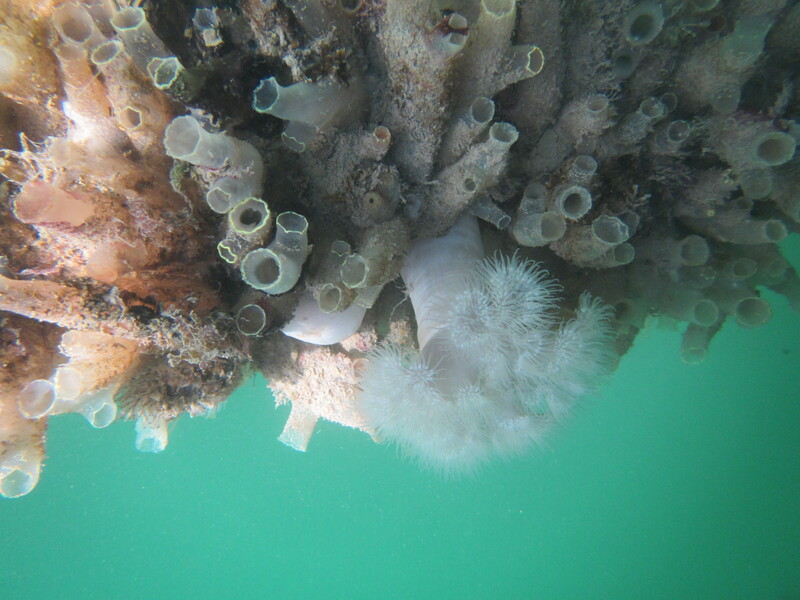 I noticed that besides the tunicates, sponges, bivalves (mussels and oysters), seaweeds, anemones and peacock worms, hydroids and bryozoans are also very abundant. I still have to educate myself a bit about these groups. The peacock worms would be beautiful for the aquarium. Although they would be easy to dislodge, it would be problematic to fasten them to something again. Maybe I’ll find a small object with some attached when I’m diving that I could take back some time (frozen artemia might be too big for them to eat, so I would need to look at artifical plankton products for food). Unfortunately, the weather turned before I had another opportunity to go diving (or snorkeling). The wind and rain have reduced visibility too much and so I’ll have to wait half a year or so before conditions improve….too bad! I missed the low tides recently as well. However, today there was time for a bit of ‘pontooning’, i.e. lying flat on a pontoon and staring at the creatures attached to it. 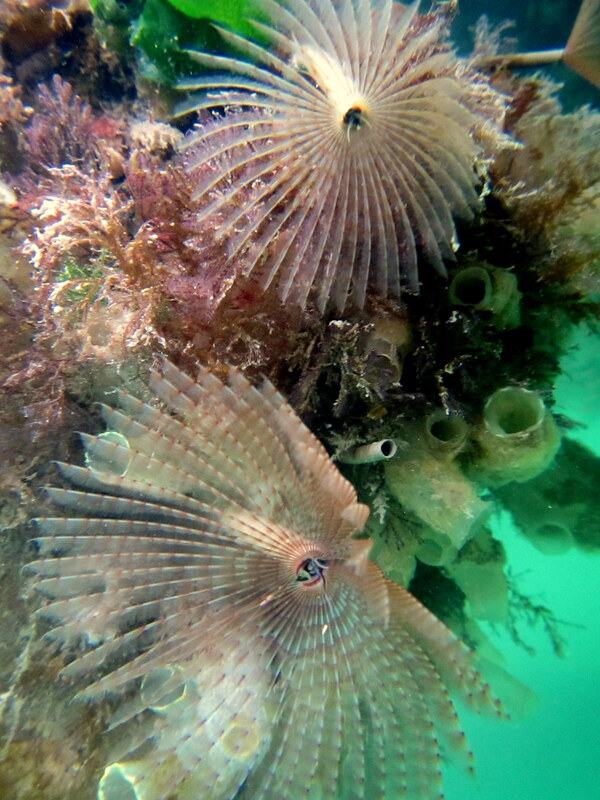 It is quite convenient as it is not dependent on tides and the communities are very different from that of rock pools. There is a very large marina at nearby Mylor Bridge that I had visited before in summer. 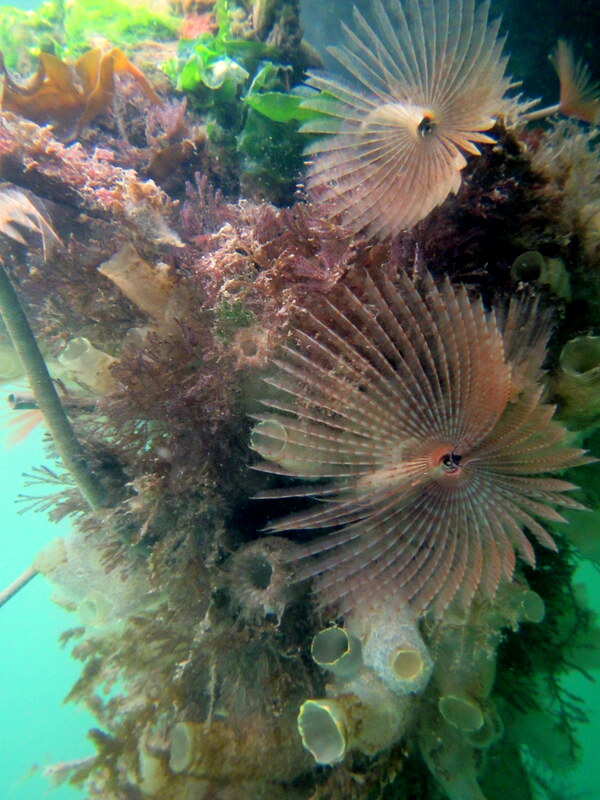 There was a bit more life then (schools of mysid shrimp, more seaweeds, more tunicates) but it is still looking nice now. I used my iPhone to take pictures before, but holding it above the water was tricky and did not produce good results so I brought my new Canon Powershot instead (still not easy to take pictures as at the same time I had to prevent my two-year old son falling in the water). 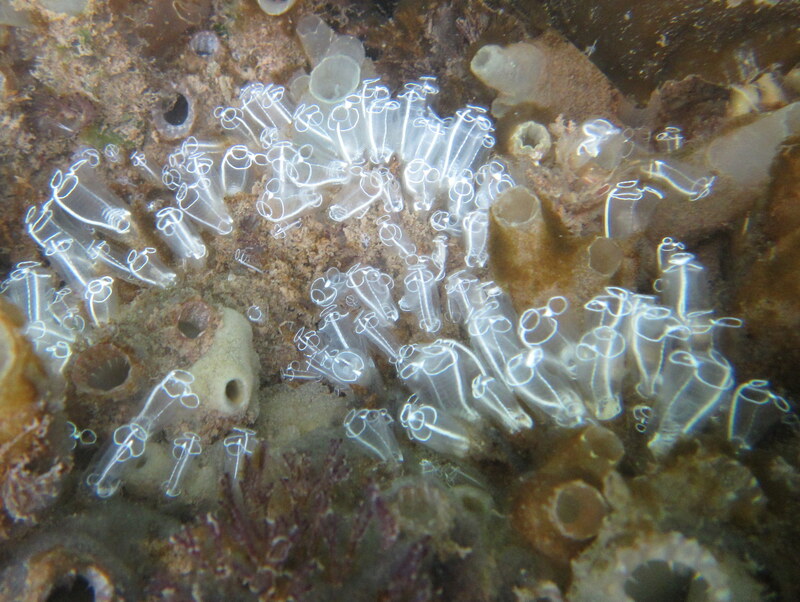 The bulk of the biomass hanging from the pontoons consists of tunicates (mainly Ciona intestinalis). 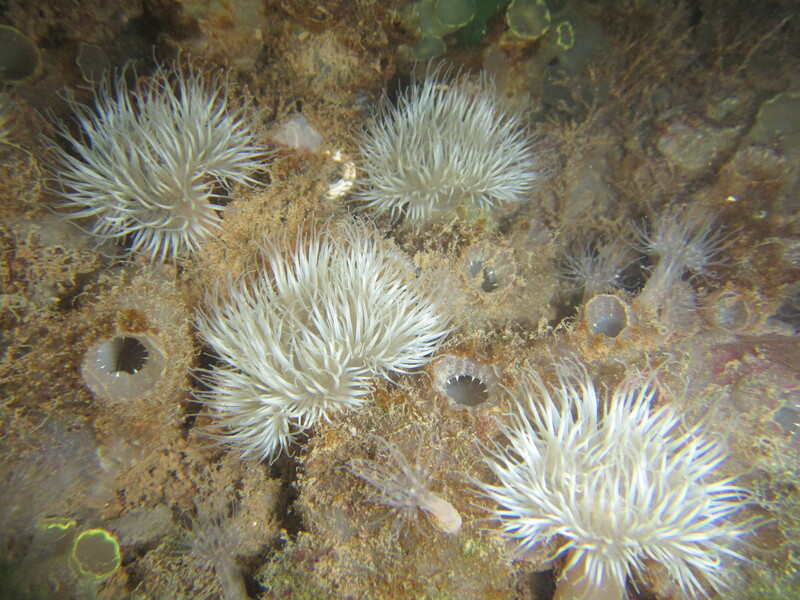 Small Plumose anemones Metridium senile are common (more about those in the next aquarium update), as well as the sponge Sycon ciliatum. 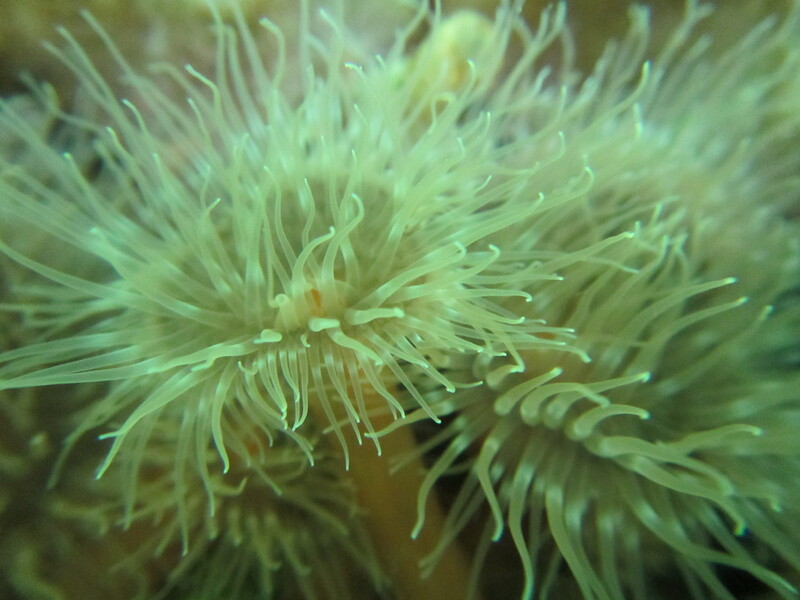 I even found a small Elegant anemone Sagartia elegans (var. venusta). The invasive Bryozoan Bugula neritina is very common; it looks a bit like seaweed even though it is an animal (see here for a description). Finally, the Peacock worm Sabella pavonina is common (and very striking). Just two pictures below as the rest was subpar; I have to go back on my own sometime soon maybe.